Happy January! I hope that 2019 is kind to you. December had some serious highs and lows in my reading. One of the highs was that I read SO MANY BOOKS! I can contribute that to getting my new Kindle in the mail. And forcing myself to rest and read in the afternoon. And being sick. And wanting to read all the Christmas books. And that 3 months of Kindle Unlimited for $0.99. Another high was that in listening to an episode of the podcast What Should I Read Next?, I came across a really fun visual way of keeping track of the books I have read. So in addition to title, author, and star rating, I now have a page in my reading journal that is a bookshelf representation of my completed books. How fun is this? I keep track of my reading from August through July (once a teacher, always a teacher). But this year I am also participating in The Modern Mrs. Darcy’s 2019 Reading Challenge. 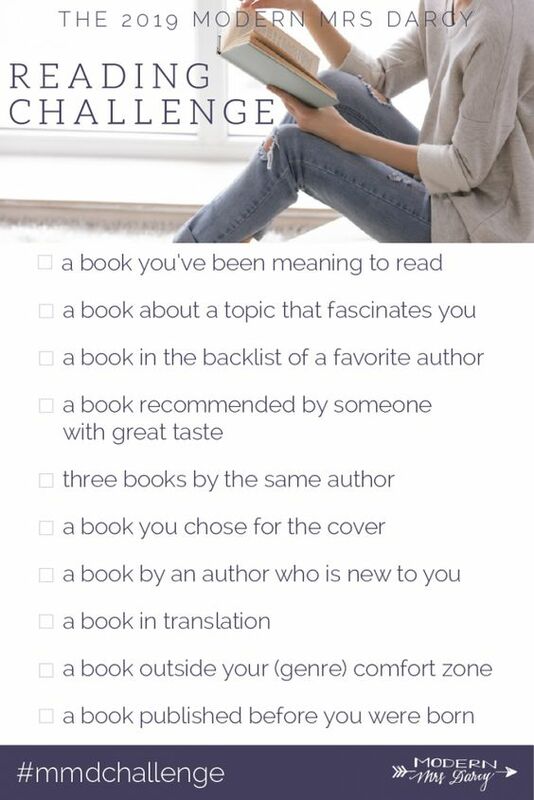 It’s 12 books, and you can choose your books based on themes. Sounds like fun, right? 2019 is shaping up to be great for my reading! Pretty soon, we’ll be leaving the reject library behind and moving close to a real library (plus bookstores). I only read 28 books in all of 2018, but I’m thinking this year will blow that out of the water. Here is what my reading looked like in December. Broken Angels by Gemma Livierno. I started this book when I was in Morocco, almost quit it for being too depressing, but then I really got into it. Then Tim wanted his kindle back, so I didn’t get back to it until mine came in December. I really enjoy WWII fiction, but sometimes it feels like the same story over and over. This book, however, was different. It followed a Nazi doctor, a young Polish woman in the ghetto, and a young Romanian girl who was being “Germanized”. They all experienced severe loss, but when their lives intersect, they were able to support one another in unique ways. This story was so hard to read, but un-put-down-able. It was a beautiful story of caring, trust, and sacrifice at a time when the world was falling apart. A Christmas Wish by Erin Green. I was so conflicted about this book. I wanted to like it, but I’m just not sure I did. I found the main character to be whiny and a little overly clingy to those kind souls who stuck around to help her. I finished the book, but I was annoyed at her most of the time. Flora was adopted as a baby after being left on a doorstep 30 years ago. Now her life wasn’t going the way she had hoped it would be. She had always blamed it on her abandonment as a baby, and one Christmas Eve made the rash decision to to go try to find her mother. Her arrival in Pooley brought to light many of the stories and secrets of village life, but would she find her true identity? Lucy Maud Montgomery: The Complete Christmas Stories by L.M. Montgomery. In addition to her novels, L.M. Montgomery wrote hundreds of short stories over her lifetime, most of which were published in magazines. Today many of them have been compiled into volumes by subject matter, and they are just as delightful as her Anne series. This is a collection of short stories that take place around Christmas/New Year’s. The book is arranged chronologically, and it’s interesting to see the progression of her writing style. It is a sweet book (though the first story was decidedly weird) and gives the reader those warm-and-fuzzy vibes that you want from a good Christmas book. Just a word of warning, though: because she wrote so many stories, she recycled plots to some extent. So if you have read some of her other work and want something really new, this may not be for you. The Ocean Liner by Marius Gabriel. This was yet another WWII book, but showing a different aspect of the era. Shortly after war was declared, the American liner SS Manhattan set out from France bound for New York. On board were both celebrities and refugees, all escaping the coming violence. In the course of the trip, friendships were formed as they sailed closer to a new life and freedom. Though this was fiction, many parts of the story were things that truly happened, and I learned quite a bit about composer Igor Stravinsky and Rosemary Kennedy. Reading about the medical practices at the time made me furious. The only thing I didn’t like about this book was that at the end it jumped crazily through time, which left me feeling rather discombobulated. I also gave up on a book this month. I have only done that a few times that I can think of, but this book warranted it. Really, I quit reading Christmas Cake Murder (Joanna Fluke) because it was just a bad book. While there wasn’t actually a murder, there was a sub-plot that was minorly interesting. Fortunately, that part was easy to pick out (written in bold and a different font), so after page 50, I just read those sections and then the last 2-3 chapters just to find out what happened. The ending was just as lame as I expected it to be, and I’m really glad I didn’t devote a lot of time to this book. My dislike was more than just the characters, but the writing style seemed forced and the dialogue was pointless. And ALMOST NOTHING HAPPENED. I’m still reading Anne of Avonlea and Wuthering Heights. I’ll finish them eventually. On Christmas Eve, Noah and I read The Polar Express by Chris Van Allsburg. How have I never read that book? It was so delightful. I’m hoping to lay my hands on a copy between now and next Christmas. I forgot to mention a book victory that happened in November. Tim doesn’t really read all that much, and if he does, it’s dense theology books or self-help books. I’m pretty sure the last time he read fiction was when we were dating and he read The Chronicles of Narnia. But in November, he asked me for a book recommendation and I gave him two fiction books (because of course). He read The Tale of the Other Wise Man by Henry Van Dyke and The Five People You Meet in Heaven by Mitch Album, and he loved them both!